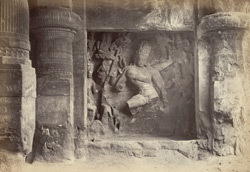 Photograph of a sculptured panel depicting Shiva dancing the Tandava dance, in the cave temple of Elephanta in Maharashtra, taken by D.H. Sykes around 1871 in James Burgess' illustrated book 'The Rock-Temples of Elephanta or Gharapuri'. The temple was probably commissioned by the Kalachuri dynasty in the 6th century. This large sculptural panel is located on the left of the north entrance of the Shiva shrine at Elephanta which was excavated in the 6th century, Kalachuri period. It represents Shiva dancing the tandava dance, the cosmic dance through which he creates the world. The forces gathered during this frantic, terrible dance, have a cosmogonic function and symbolise the powers of the evolution, maintenance and dissolution of the world.